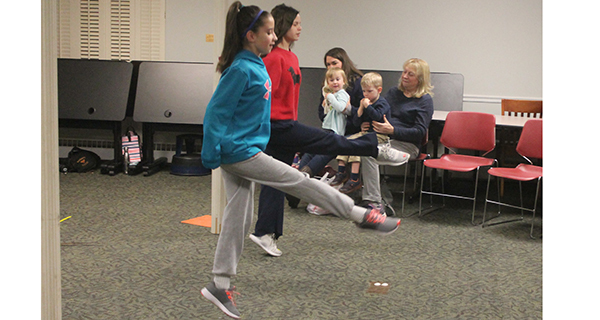 While far too young to remember the wildly successful nineties cultural phenomenon “Riverdance,” the children who gathered at the library on Tuesday to learn about Irish dancing were nonetheless delighted to take their first steps. “It has more of a hook because you’re working rhythmically, number one,” explained Harney, “and you’re only working in foot patterns, so you’re not trying to coordinate the eyes, the upper body, the arms, and the legs. You can catch their attention much quicker through just giving them simple patterns of their feet.” Harney used to own a studio in San Diego that taught all styles of dance, but used Irish dancing as the seed through which students understood the other forms. Harney’s student helpers wow the crowd with their full-speed moves. Dealing with such a young group of students provided many issues for Harney - firstly, their inability to distinguish left from right. 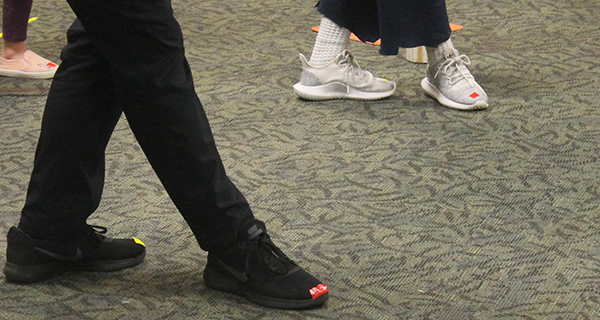 To get around this, small pieces of red and yellow tape were placed on the children’s shoes, and the instructions became color-coded rather than based on left and right. Harney used a variety of methods to keep the kids’ attention, ranging from a game of “Irish dancing baseball” to a circle dance, to a hand clapping game designed to teach kids musical rhythm. A few times, the kids were taught a series of steps in slow motion. Two older helpers of Harney’s then showed the kids what the steps looked like at full speed, and with musical accompaniment. This elicited “oohs” and “aahs” from the children every time it happened. The primary difference between this class and one at Harney’s studio is the homogeneous ability of everyone involved. While everyone at the library was a day-one beginner, in a real studio, classes would be broken down into four levels of student - a technique Harney believes motivates students to consistently strive to advance to the next level. Pieces of red and yellow tape helped youngsters distinguish left from right.